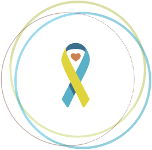 In honor of National Autism Awareness Month, ds-connex is pleased to feature the Down Syndrome – Autism Connection to share their mission and highlight the support they offer to families raising a child with a co-occurring diagnosis of Down syndrome and autism. We were happy to learn about the organization from their executive director, Charlotte Gray. Charlotte became involved in the organization because she has a son with DS-ASD. When her son was five years old, he received his autism diagnosis; this brought feelings of isolation for Charlotte and sparked her desire to connect and support other families on this complex journey. “I can’t tell you how much this group has helped me get through the tough times, but how much they also celebrated with me when Jake would achieve even the smallest things because they understand,” Charlotte shared. According to the Down Syndrome – Autism Connection website, it is believed that 18-39% of individuals with Down syndrome may also have autism. 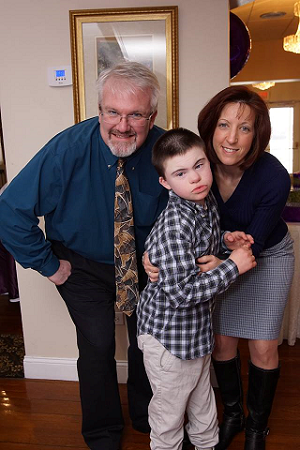 The Connection has a partnership with the Massachusetts Down Syndrome Congress, and they receive many referrals from them, which allows them to reach out to the families. They also get referrals from the Down syndrome clinic at Massachusetts General Hospital, which is run by Dr. Brian Skotko. He provides the Connection’s Get Connected kits to new families getting the ASD diagnosis, and two other Down syndrome clinics in Massachusetts give the kits out to families as well. The Connection also has a partnership with the National Down Syndrome Congress, where they have their own DS-ASD track that allows them to connect to families. They are also able to support families through a closed Facebook group which currently has over 1400 members from all over the world. The Connection is able to provide valuable resources by presenting at conferences and via their Facebook page, and also through a monthly online chat and quarterly e-newsletter. They also offer webinars and facilitate sharing sessions via conference calls for those who aren’t able to travel to conferences. Their Get Connected welcome kits are full of resources and inspirational stories and are great for professionals who work with individuals with DS-ASD as well as their families. In addition to all of the networking opportunities and support offered to families, the Connection is also an influential advocate, going to the State House in Massachusetts as well as Capitol Hill in Washington to be their kids’ voices and the voices of their families to advocate on certain laws that impact their kids. They strongly encourage families to get involved as advocates by making phone calls to their representatives to explain how they can support their child’s needs. These advocacy efforts have also led to an initiative with the NDSC to change the wording on an autism research policy called the CARE Act, to include individuals with a co-occurring diagnosis so that they can be included in that policy as well. The Down Syndrome – Autism Connection is a priceless resource for families touched by a co-occurring DS-ASD diagnosis. To learn more about their organization, please visit their website (www.ds-asd-connection.org) and Facebook page (Down Syndrome-Autism Connection Support). If you would like to see other Down syndrome support organizations featured in our blog: submit your story ideas to: support@ds-connex.org.